The Wall Street Journal gets a prize for Art in Economics for their Phillips curve article. Abstract expressionist division, not contemporary realism, alas. You might be interested in this related post entitled "Employment doesn't depend on inflation." The model arising from his framework shows what may be to you a surprising relationship between nominal shocks and changes in employment. (σ in blue, ℓ in yellow). 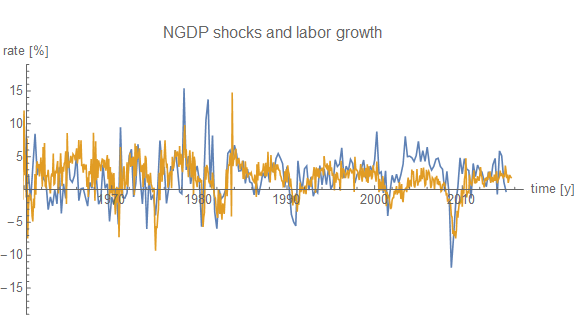 "Effectively, employment growth is the part of nominal output (NGDP) that is left over after accounting for inflation. Thus there shouldn't be any relationship between inflation and unemployment -- i.e. the Phillips curve isn't real. This even applies to a version of the model consistent with expectations..."
Seems you got here first. I should have said "rational expectations" in that final quote. 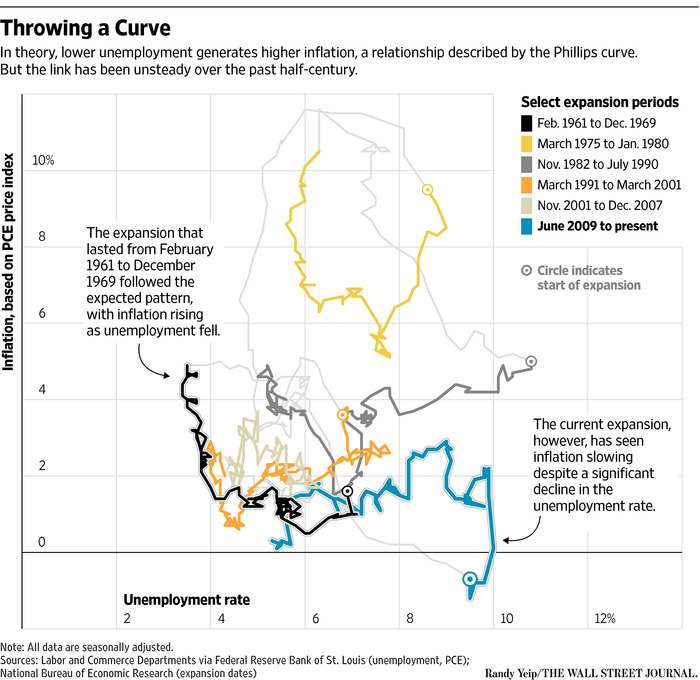 Overall, it takes a heroic dose of pattern recognition to see the Phillips curve. That graph is pretty ridiculous! How much, if any, of this is due to changes in methodology? IIRC, Clinton changed the way unemployment is calculated back in the 90s. CPI seems to undergo mutations rather frequently. The relationship actually seems to be present in the '61-'69 data but that was before Nixon made us all Keynesians. After that, it just looks like the path I follow out to my car when the bar closes. Right now we have low inflation (a/k/a price stability) and low unemployment, which are the "dual mandate", yet things just aren't right with the economy. Either the goals are wrong or we're following the wrong numbers. A follow-up thought. Wasn't Phillips' original idea that there was an inverse relationship between unemployment rate and wage inflation? Should we call this a Phillips Curve since Phillips' work was not employment vs general prices, but employment vs price of employees? That concept was extrapolated by others to using price inflation, correct? I think the assumption was that the prices a business charges are correlated with the wages it pays. But labor is only one cost input, so is that a valid jump? Should we really expect the above chart to make sense or to follow a true Phillips curve of employment vs wage inflation? The unemployment rate (in and of itself) does not give a complete picture of employment trends. A better measure (in my opinion) is the employment to population ratio. "William Phillips, a New Zealand born economist, wrote a paper in 1958 titled The Relation between Unemployment and the Rate of Change of Money Wage Rates in the United Kingdom, 1861-1957, which was published in the quarterly journal Economica." "Similar patterns were found in other countries and in 1960 Paul Samuelson and Robert Solow took Phillips' work and made explicit the link between inflation and unemployment: when inflation was high, unemployment was low, and vice versa." And so you might call it the Solow / Samuellson curve. The graph reminds me of the big Picasso sculpture in the Loop. Just don't make the mistake I made and tell your therapist it looks like two cats fighting over a hamster. I did and now I'm not allowed to handle any sharp objects for a week. Lol, ... that's the 1st time I've seen an extended Shakespeare quote on any macro blog -- but it seems to fit. How would the graph of labor non-participation versus inflation look? It ought to be a horizontal line. Reason is that if people VOLUNTARILY withdraw from the labor force (which is what the phrase “non-participation” means), then demand declines because those people no longer have a wage to spend. But aggregate supply also declines because those people are no longer available as a source of “supply” or labor supply. Put another way, if a group of people voluntarily cease participating, government if it’s doing it’s job right, will take notice, and cut aggregate demand in proportion. At least that's what government would do if unemployment was already at the lowest feasible level (NAIRU). Though obviously the idea that government gets that sort of thing right in the real world is fanciful. How is it that the Phillips curve is still taught to impressionable youngsters? Isn't it beyond time that this theory be retired? Do you still teach this theory to your undergrads? So you’re saying there’s no relationship between inflation and unemployment? That’s great news: we could organise a huge increase in demand (e.g. by printing and distributing $10,000 to every household). Unemployment will drop to near zero and there’ll be no increase in inflation? I think that’s a bit unrealistic. Yes, you cannot create real growth through purely monetary methods. Your proposed policy will create inflation but will not have a meaningful impact on employment. In fact, as it would be so surprising and erratic, I would guess it would destroy a few million jobs. The US Federal Reserve should abandon its inflation target and instead shoot for 2% unemployment. If they fail so what? Worth a try. The IT is obviously a global slot. Would chronically tight labor markets in the United States be such a bad thing? How would the voting public feel about free enterprise if they were chronically tight labor markets? Can you explain why economists show the presumably dependent variable (unemployment) on the horizontal axis when the universal convention of Western science and technology plots the independent variable (inflation) on the horizontal axis? HI. Good question. With the Phillips curve plot in particular, I think the best answer is that there is not really a presumption that one is driving the other; they are more both outcomes driven to some degree by monetary policy tightness or ease, and here conventional and Keynesian economists (and the business news shows) presume that the driver (not plotted in the PC graph) is lower interest rates (where the monetarists argue it more the underlying monetary inflation itself, i.e., reserve creation times monetary multiplier effects). The PC graph shows both CPI and unemployment. The CPI presumably represents the price inflation, which per the monetarists at least results from monetary inflation (central-bank easing). Lower unemployment, too, presumably results from the easy money (or the lower interest rates, per the Keynesians). But (as monetarists point out) there is also the question of different lags: Presumably, money prompts growth first (1-3 quarters) and ends up in inflation later (1-3 years), so one could play with variants of the data to plot. But Bill, your question needs always to be asked about any x-y plot or econ graph (even P/Q), so kudos. Silly me. I failed to mention the other main presumed policy driver besides monetary policy, which is fiscal policy (spending, taxing, borrowing). And of course there are other policy drivers and certainly non-policy drivers (e.g., ideas).